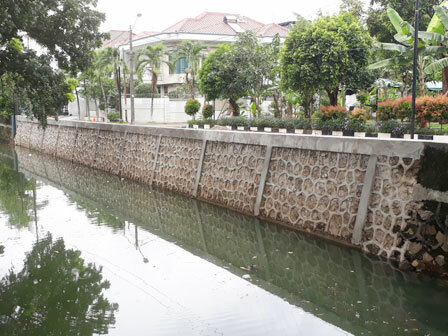 Four retaining walls of rivers and connecting (PHB) channels in Kelapa Gading, North Jakarta, have been repaired. It is faster than the target which is by the end of April.
" We repair it by rebuilding the broken parts"
Kelapa Gading Sub-district Water Resources (SDA) Unit Head, Rukmana said, retaining walls need to be repaired because of decline in the construction and some parts are crumbling. "We repair it by rebuilding the broken parts. Especially with elevating Sunter River's retaining wall to anticipate water from overflowing," he explained, Thursday (3/22). He mentioned, Janur Elok PHB channel at RW 06 Kelapa Gading Barat is repaired along 59 meters with 3 meters high, Janur Elok PHB channel at RW 11 Kelapa Gading Barat is repaired along 161 meters with 2.5 meters high. Then, Pelepah Indah PHB channel retaining wall at RW 18 Kelapa Gading Timur is repaired along 92 meters and 3.5 meters high, Sunter River retaining wall at RW 04 Kelurahan Kelapa Gading Barat is repaired along 325 meters with 0.70 meters high. "Now, Sunter retaining wall is elevated into 1.5 meters high," he conveyed.